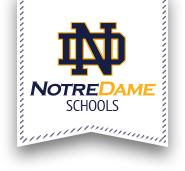 Supported by a grant from the local American Heart Association Community Impact Grant, Notre Dame Elementary School was able to install a rock climbing wall in their gymnasium. Surrounded by the faculty and staff, representatives from the American Heart Association, as well as the entire student body, the rock wall was unveiled at a ribbon-cutting ceremony to cheers. Installed along one side of the school’s gymnasium, the rock wall measures 40 feet long by 8 feet high and features 200 hand holds. It is a traverse wall, where most climbing is done horizontally. Vertical climbing is limited to a few feet. The wall will become an integral part of the physical education curriculum and complement wellness education efforts at the school. It’s colorfully painted with an Adirondack theme, topped with a Notre Dame Elementary flag. "This gives students who do not have an opportunity to go mountain climbing or rock climbing that experience. It helps develop the muscles and skills necessary, in case down the road, when they get older, they develop an interest in outdoor adventures,” said Bryan Koscinski, a physical education teacher at Notre Dame Elementary.